Friendship, cleverness and The Lodger (2010) | Randomwhoness: a Doctor Who blog by Johnny Spandrell. Sampling stories in random order. NEXT TIME… Don’t look so worried. Fancy a cup of tea? It’s more Cyber hijinks in The Invasion. LINK to The Wheel in Space and The Invasion: they all feature ‘buddies’. That is, the combinations of Troughton/Hines and Smith/Corden would fit right into a buddy comedy. Your classic buddy film, comedy or otherwise, features two main characters, usually men and usually from different backgrounds, with contrasting approaches to problems, forced to work together and through which they form an oddball friendship. Think 48 Hours or Wayne’s World. 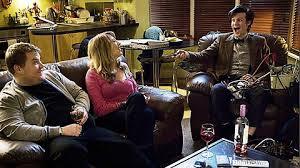 Doctor Who‘s tendency to match the Doctor with a female companion tends to work against the buddy comedy format. But The Lodger is a genuine stab at it. It’s a story of two men trying to understand each other’s worlds; Craig (James Corden) gradually unpicking the mysteries of his new lodger, and the Doctor (lanky, loping Matt Smith) trying to work out how to fit in what we would call a normal life. This last aspect becomes a theme of Smith’s tenure. It pops up again and again, notably in The Power of Three and The Doctor, The Widow etc. It’s a terrific conceit because when looked at objectively, the Doctor’s life is bewilderingly crazy. And when looked at objectively, most modern life is too. The Lodger seems to be saying the real world is just as mad as the Doctor’s, depending on your perspective. It works nicely because both Corden and Smith can bring the funny. An important part of the buddy pairing is that there’s no straight man; both buddies are funny in their own different ways. We’re quite happy to watch either one of them on screen, although as viewers, we’re positioned to side with Corden and view the Doctor as a funny, alien fish out of water. And from the DVD extras we know that Corden and Smith are great mates, and that chemistry is evident on screen. It doesn’t seem that big a leap to imagine that Corden might have been persuaded to do a Catherine Tate, and go from one off guest star to ongoing companion for a year. It would have been an interesting and innovative combination for Doctor Who. A year of buddy comedy. It would have really subverted the series norm or Doctor/Girl. We have to look right back to the Troughton years to find a similar pairing, and that’s the Doctor and Jamie. Like the Doctor and Craig, they are both funny, both capable of holding the audience’s attention and the chemistry between the actors is evident. And of course, all four act like overgrown teenagers, so in each pairing there’s a sense of men behaving badly. Look, I love The Lodger. Everyone loves The Lodger. It’s like that cheery, boozy mate we all have. The one who hangs about a lot, cracks some jokes, gets into a few scrapes but is always up for a good time. He’s brilliant. But you don’t spend too long in this mate’s company. Look too closely, and the shine goes off him a bit. Here’s what I mean. Part of what The Lodger does is show how the Doctor would react to adopting an everyday suburban life. And it turns out, he’s rubbish at it. Hilarity ensues. Oh that daffy old Doctor. He doesn’t know how much rent to pay. He doesn’t know what football is. He can’t remember why he’s called the Doctor. But as funny as all this stuff is, we have to ignore much of what we know about the Doctor to make it work. We know he’s not this dumb. He’s spent loads of time in contemporary Britain – more than he spends anywhere else (he was exiled there once, remember). So he knows you don’t air kiss everyone you meet. Of course he does. Just as he knows that screwdrivers don’t have on switches. He’s a genius, remember? No, on second thoughts, forget it. Because that would spoil the joke. We also have to ignore the way a Doctor Who story normally works. The threat in this story is an alien spaceship lodged on top of Craig’s house, threatening to spin the TARDIS off into oblivion, with Amy inside it. What the Doctor would normally do is go upstairs and sort it out. Indeed, this is what Amy keeps telling him to do. But no, says the Doctor, it’s too dangerous, I don’t know what it is, I need more info. I’ll just build a wacky machine and talk to this cat instead. Because if I do the most logical thing and behave in the way I normally do, the story will end after about 10 minutes. But you can’t stay mad at that loopy, boozy mate of yours for long, and so it is with The Lodger. Look at the way Craig is suddenly brought up to speed with everything he needs to know about the Doctor, the TARDIS and the situation at hand. Three big head butts. Funny, but saves precious minutes of dull exposition. And there’s one particular bit of plotting which is inspired. It starts in the terrific scene where Craig is hoping for a canoodly night in with Sophie (the brilliant Daisy Haggard, see her be hilarious in Episodes if you haven’t already), but the Doctor has unwittingly gatecrashed (oh that silly old Doctor, and so on). ‘Six billion people’, he muses at one point. ‘Watching you two at work, I’m starting to wonder where they all come from’, which is pretty rich coming from the chief gooseberry. DOCTOR: Everybody’s got dreams, Sophie. Very few are going to achieve them, so why pretend? Perhaps, in the whole wide universe, a call centre is about where you should be. SOPHIE: Why are you saying that? That’s horrible. SOPHIE: Of course it’s not true. I’m not staying in a call centre all my life. I can do anything I want. SOPHIE: Oh, yeah. Right. Oh, my God. Did you see what he just did? DOCTOR: It didn’t want Sophie before but now it does. What’s changed? I gave her the idea of leaving. It’s a machine that needs to leave. It wants people who want to escape. And as preposterous as a spaceship dependent on its pilot wanting to leave is – or perhaps it’s just a little too thematically perfect to ring true – I think the Doctor planting the idea in Sophie’s mind which will eventually be the key to solving the mystery, is neat writing. And hiding it in a jokey, seemingly inconsequential scene is very skillful. Hidden in plain sight, to use a Moffatism. That funny old mate of ours is a bit smart too. But then, that’s why we’re buddies. LINK to… Oh, we’ve already done this bit. NEXT TIME… Oh, we’ve already done this bit too.